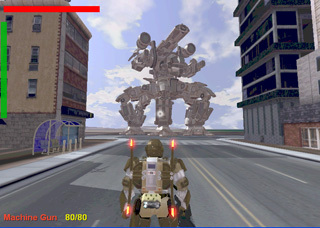 A group of mech-style robots, varying in size (from twice human size, up to about 100 feet tall for the master robot) are moving across the terrain to attack a human city. When they get to the city, they will destroy it. The players are humans trying to halt this attack. The robots are generally too big and well-armored to be destroyed outright, so the humans must focus their weapons on soft points like the robots' joints. The goal is to damage and destabilize the robots enough that they fall. Secondary attacks should play a large role, such as blocking or tripping robots with other fallen robots, or knocking heavy pieces of the environment onto the robots to damage them. Robots attack players with ballistic weaponry, and also try to crush players beneath legs and wheels. Other people involved with the game were: Atman Binstock as the other main programmer; Jennifer Estaris in a production role; Ethan Abramson, Clay Sparks, Matt Vitalone, Jorge Hernandez, and Peter Kim doing the various kinds of visual art; and the folks at dSonic doing audio. If you'd like to understand where the name Happycake comes from, you can watch this video (though be warned, it's over 100 megabytes).